The proposal for the stock split was first announced last summer. The split was delayed because of a shareholder lawsuit, but the firm's board of directors approved the issuance of Class C non-voting common stock last month. The Class C stock will be issued through a stock dividend on a 1-for-1 basis to all existing holders of Under Armour's Class A and Class B common stock. The distribution of the new Class C Under Armour stock will have the same effect as a 2-for-1 stock split. On April 7, Class C shares will be distributed to shareholders as of March 28. The new shares will trade under the ticker "UA.C." Class A shares will continue to trade under the ticker "UA." Founder, chairman, and CEO Kevin Plank owns all the Class B shares, which have 10 times as much voting power as the Class A shares. Plank will retain his control over the company since Class C shares have no voting power. Plank started Under Armour in 1996 in his grandmother's basement with a prototype for a sweat-wicking compression shirt. He has built Under Amour into a $36.55 billion company, which has become a formidable rival to Nike Inc. (NYSE: NKE). Despite Plank's successes and leadership abilities, the new class of shares did not come without controversy. On Aug. 26, Under Armour held a special shareholder meeting that allowed shareholders to vote on proposed changes to its charter. Those changes included amendments to the company's incentive plan and Class C stock purchasing options for employees. Also included was a non-compete agreement for Plank. Plank signed an agreement not to compete with Under Armour for five years if he leaves the company. He also agreed to vote his shares in favor of those changes. 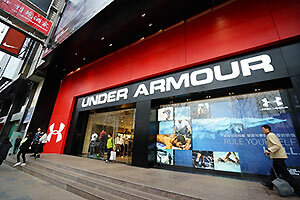 The company said the changes would be implemented before the Under Armour stock split. But shareholders filed a class-action lawsuit against Under Armour on June 18 alleging the company's board members breached their fiduciary duties by recommending the changes. Shareholders and the company resolved their differences, and the stock split and issuance of new Class C shares were approved several months later. This Under Armour stock split marks the third time in three years the company has split its stock. And more stock splits are likely. The company doesn't plan to conduct another Class C split. But Under Armour said during its August 2015 shareholder meeting that said there will be "lots more regular splits" in the future. Under Armour stock has been a standout since its November 2005 IPO at $13 per share. At a recent price of $83, Under Armour Class A shares are up 213.5% and 385.95% over the last three and five years, respectively.